Being a widespread, multifactor, complex disorder with many risk factors, asthma can be classified according to different criteria. Asthma is most common during childhood, although it can appear in adolescents, adults, and the elderly. 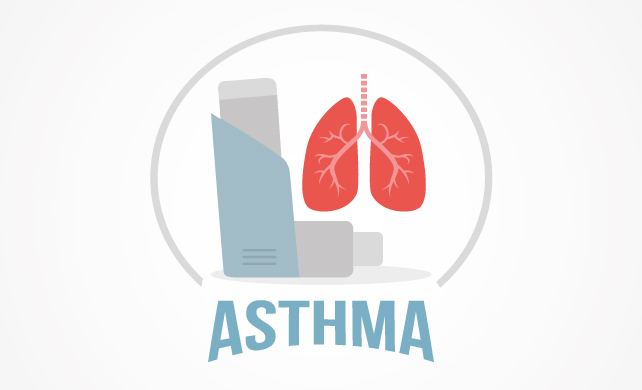 There are all sorts of possible causes for the development of asthma, from genetic, to occupational, and it can be related to obesity, physical activity, respiratory infections, and smoking. It can also appear for no obvious reason in a person with no risk factors. That is why there are different classifications of asthma, two of which will be presented here. These symptoms should not occur more often than twice in 7 days. If the symptoms appear at night, they should not be more frequent than twice a month. When performing spirometry (a simple test of lung function), the parameter FEV1 is the most important one. It represents the maximum exhaled air volume in the first second of forced expiration, after maximum inspiration. In persons with intermittent asthma, it should not go below 80 percent of normal values. This type includes all of the symptoms of intermittent asthma, but the difference is in terms of their frequency. Mild persistent asthma is characterized by more frequent occurrence of the symptoms, up to 6 times per week. During the night, the symptoms are also more frequent, and they appear up to 4 times a month. As you probably can guess, moderate persistent asthma includes more severe symptoms of air obstruction, appearing almost every day. At night, symptoms can occur more than 5 times a month. FEV1 is usually lower than 80 percent, but rarely over 60 percent of normal values, which shows a more significant airway obstruction. This is the most severe clinical manifestation of asthma, with persistent symptoms and FEV1 lower than 60 percent. Symptoms are also very frequent at night, so there is a risk of chronic sleep disturbances. This is the most common type of asthma. It can be related to some specific allergen (tree or grass pollen, dust mites, etc. ), but more commonly, persons with allergic asthma were born with the so-called atopic constitution. That means that their immune system is out of balance in such a way that it creates an immune response to multiple allergens. Allergic asthma accounts for over 90 percent of cases of childhood asthma. Other than by allergens, asthma symptoms can be triggered by other environmental factors. These include frequent infections of the airways, air pollutants, weather changes, stress, physical activity, and sometimes different food. The symptoms of airways obstruction are the same, but they usually appear timely-related with some of these irritants. However, in order to make a definite diagnosis of non-allergic asthma, the patient must be tested to all common and suspicious allergens first. This is a type of asthma occurring usually in children and it does not have very clear margins. The mechanism of development is similar to that in nonallergic asthma, but here, the environmental factors cause prolonged bronchitis, which eventually causes airway obstruction and asthma symptoms. The diagnosis of late-onset asthma is made when the symptoms of airway obstruction appear after the age of 20 years. Of course, a detailed examination is required, including chest x-ray and spirometry, in order to exclude other causes of airway obstruction. In most cases, a late onset or long-term allergy to some allergen can lead to this condition. Nonallergic causes also can contribute to late onset asthma and need to be considered. As a rule, asthma patients have no symptoms between attacks. Even in patients with severe persistent asthma, the airflow should significantly improve after inhaling a bronchodilator drug. Therefore, the airways obstruction in asthma is considered reversible. However, there is a subgroup of patients whose obstruction never goes away, meaning that they have a fixed airflow obstruction. The differential diagnosis between asthma and COPD (Chronic Obstructive Pulmonary Disease) in these patients can be very hard, since the irreversible airway obstruction is the main difference between asthma and COPD. Not so recently, obesity has been classified as a disease. Today we know that besides its effect on blood cholesterol levels, insulin resistance, and cardiovascular health, obesity is also related to the disturbances in the immune system. Obese persons have increased levels of substances that typically appear in any chronic inflammation. Therefore, it is not hard to guess why more and more studies are confirming that asthma symptoms are worse in obese patients and correlate with the level of obesity. Some air pollutants in the workplace can cause occupational asthma. Persons who work with dusty materials, bakers, and woodworkers are particularly affected. Furthermore, chemical vapors are present in laboratories and factories, and all that can contribute to the development of occupational asthma. If the symptoms of airway obstruction get worse during working hours, this is something that should be considered. With aging, the whole body goes through significant changes. Deterioration of the lung function is not rare among persons older than 65 years. Loss of elastic fibers in the airway walls, weakening of the chest muscles, and changes of the rib joints are usually blamed for the appearance of asthma symptoms in the elderly. This is a special group of patients because they usually have other medical conditions and use one or more medications on a daily basis. Introducing the asthma therapy to those patients has to be done with caution. Severe asthma is the most difficult and luckily the least common type of asthma. It is diagnosed in patients in which the combination of the usual drugs used for asthma treatment does not bring symptom relief. These patients require a different approach to lifelong treatment which has to be individually adjusted and their condition needs to be closely monitored.